Truth is, I don’t like to talk about my anxiety. I’m almost positive that that seems weird to some of you being that I started this blog, especially to shed some light in the mental health community. to be honest I struggle every. single. day. And I have ever since I can remember. Being a mom has made it so much worse. 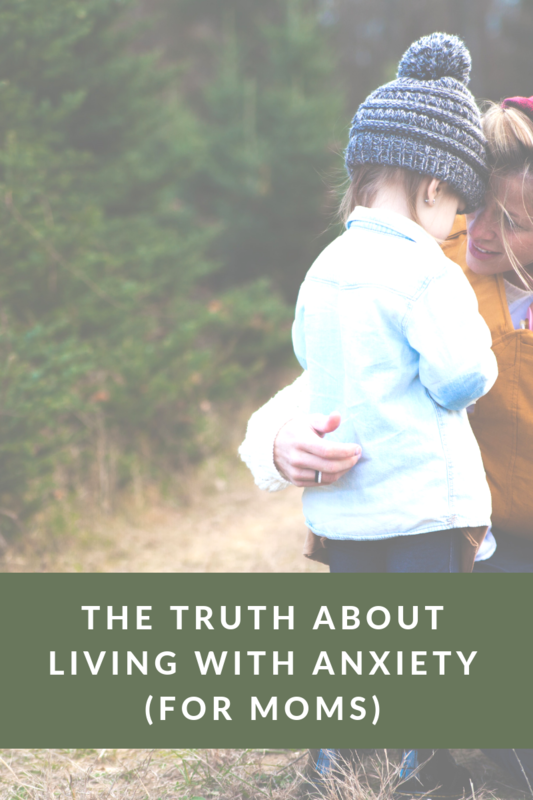 Being a mom who suffers from anxiety isn’t what others might think it’s like. Living with anxiety can be so much more than just doubting yourself or every decision you make. It’s so many emotions that can’t be explained. To make it worse, the comments and judgment that go along with that word can be very disheartening. Leaving so many of us speechless, and not wanting to talk about it. There’s not a lot of talk going on in the mental health community as it is right now, or at-least not enough of it to make that movement fully happen, yet. I believe that it’s because so many of us, myself included, choose to go with the social “norms” instead of sticking to our authentic selves. In fear of the anxiety that comes when you open yourself up to anyone or become vulnerable in any means. There is almost an immediate sense of solidarity that comes along with it that can’t really be understood until you have been there yourself. I’ve read books, listened to podcasts and have followed several people to help keep me motivated on my self love journey and what I’ve come to realize is that we all have bad days. Even the most positive people you follow have bad days, and act in unhealthy ways. Legitimately, we ALLLL have bad days. When your a mom, it just so happens to be that those bad days happen a lot more. Am I wrong? If so… I guess I’m not right. But I feel really strongly that I’m not alone. Basically, it’s just never going to happen. So we drive ourselves insane. Atleast I do. The never ending sink of dishes and crumbs on the floor and the unorganized toy bins that i keep pretending are organized.. it gets to me. It really does. I don’t know why, I try to ignore it, but until my house is clean it will continue to be on my sh*t list. Same goes for laundry.. I can’t seem to keep up. If I did, I would legit be holding up a laundry service 24 hours a day. And I just can’t do that, not with everything else I do that no one else wants to do. I mean, who else is going to do it all? Mama, you reading? do you feel me? Speaking of being a mama… yea that. Being a parent is hard y’all. And not even to mention: super expensive. Can I get a hallelujar? It’s not at all peaches and cream like we may have thought when we dreamed of becoming a parent was before we actually became one. Maybe my personal perception was just so far off because I was the youngest of 4 siblings and by the time I came around there wasn’t much parenting going on, if you know what I mean? don’t get me wrong, I love my babies and my husband more than life itself, but living a life full of anxiety, trying to teach my kids that nothing in life is free, and having no friends was not what I pictured for myself. Even when you just need, like, 5 seconds to pee. So.. there’s that. It’s not enough that you don’t go so above your own needs that you forget to eat, drink, or even brush your own teeth somedays. I gotta repeat since it’s so constant in our lives: Someone always needs SOMETHING. Of course I love doing things for our family, and it makes me happy and does fill a desire in my heart, but at this stage we are in right now with three littles running around we must just do what is best for us all. It just happens when your life is full of chaos. And I love my kids, SO much. But they are chaos. And do you ever think that they think about what mama might need? No. They’re kids, so what can you really expect. So that means more time at home, and unless you have the time it takes , energy you need, and money to take the crazies out in public. (I honestly don’t do that very often myself.) I’m trying to get better, though. We make it to church, to the grocery store (sometimes), and of course school. Other than that, I have found it’s easier on all of us to just stay home. the world out there can be frightening when deep inside you are filled with anxiety but keeping composure just praying that someone will ask you if you need a hand, and no one even knows it. Then being alone all the time doesn’t help with anxiety.. like at all. In fact it adds to it. And then being in public adds to the anxiety at times, because sometimes it’s a struggle just to be social. Even when I want to be. It feels like i can never win that war. Trying to have a social life is a lot harder than it may seem for those of us on a mental health journey. There’s a want, need and a desire for socialization but there’s something holding us back.. like judgement of course. Then you just start to dislike people because it feels like no one gets you. Sound familiar? It just gets so exhausting on your mental, spiritual, and eventually your physical health. Anxiety is the true definition of what a backstabbing liar is. Or even so, a narcissist. Those negative voices telling us that everything we do is wrong. You know, those ones we listen to that leave us feeling scared sick, and alone. The lies. Oh the lies. Judging ourselves and comparing is what most of us resort to and it leaves us feeling empty inside. Like we will never amount to anything because we choose to stand out on our own and to say yes and no when we want to and not just when it makes us cool enough to fit in. We will never be that person that we are comparing to. We all have different pasts, we are each living different lives, and none of our futures will be the same. So why do we as people, as mothers, as friends judge each other so harshly? Why do we cave and bow down to the anxiety that overwhelms us and keep ourselves hidden? Making friends shouldn’t be as hard as it is, but because of the culture we live in it’s become really, really hard. Even at church! When everyone is as easily offended as they are these days its almost impossible to not hide out when you have a bad day. You know those days where you can’t say anything nice, so you choose to not say anything at all? To anyone? So instead of owning it, you hide out, beat yourself up for having feelings, and you dig yourself into a deeper hole of despair. I know because this has been my life. Plus, these kinda days are just more common when your a parent, just sayin. We all just want to do our best, and hopefully for ourselves and not just everyone else. When i see another mama (or a dad) keeping to themselves, what I have learned is that maybe what they really need is to know that they aren’t alone. Maybe they need someone to let show them that it’s ok to have bad days, to cry laugh and scream within the same hour, and to not cook dinner for a week when we just don’t have the energy to. Reach out your hand and be the friend that you wish you had. Do you want more encouragement? Encourage others! Do you want more love? Love others! Do you want more friends? Be a friend to others! I know it can sound easier than it actually is to do it. I know there are weeks where it feels impossible. Rest in those moments; just don’t unpack and live there. We must take action if we want a better life for ourselves. We’ve got to stop being so judge mental to other moms, but most importantly to ourselves. We have to give ourself second chances, and third chances and fourth chances. We have to keep trying. For ourselves. When we become so filled with our own perceptions of what other people think of us we lose the authenticity in our life. The more I have been growing, I have realized that my heart has always had a hidden desire to explore so many more things. I am so happy with the fact that I started this blog a little over a year ago now because the community that has come with it is incomparable to the weight of the world I was feeling before. I needed to fill that need within myself which was to know I wasn’t alone. I’m so happy with the outcome from it and the person that i am becoming because of it. If there is one thing I wish I could teach every single person in this world is that you are truly not alone. It doesn’t matter how much rejection you have faced in your lifetime, how much you have missed out on, or how much you have been taught to hate who you are. And so does the life you are living. Anxiety has taught me so much about myself and the power I have in my own thoughts and in my own life. My passion has become to share that with other people. A new breath, a new perspective, and a new attitude. Tomorrow is a new day. Breathe mama, breathe. I know how hard it can be mama, just keep breathing. Just keep going. We’ve got this. PS: No matter who you are, you always have a friend in me.